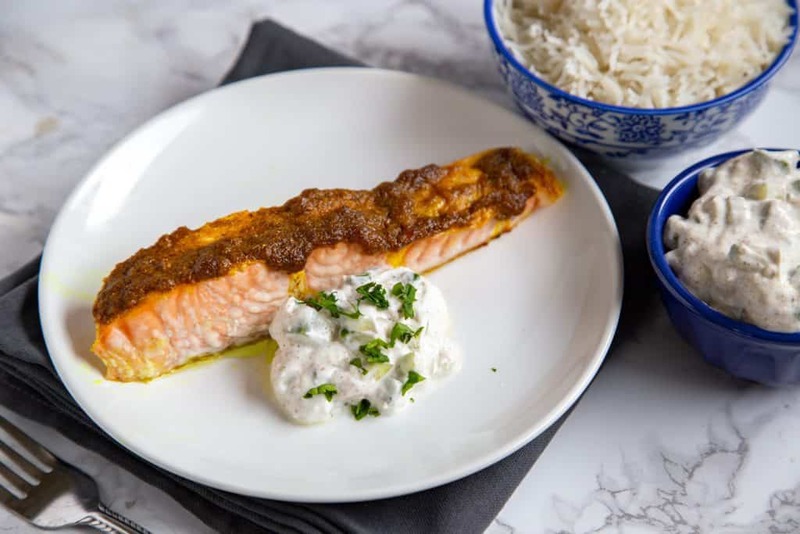 A simple recipe for Indian spice-rubbed salmon with creamy cucumber raita – serve with basmati rice for a quick 30-minute weeknight dinner. My husband puts hot sauce on EVERYTHING, but I prefer richly spiced and flavored foods. Bold flavors in recipes like this curry seitan with pineapple rice and the rich soy chorizo in these chorizo stuffed sweet potatoes make me excited to eat dinner every night. So when I was thinking up a new way to make salmon, I turned to spices. 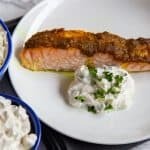 I’ve made a simple roasted salmon with a cucumber yogurt sauce or raita dozens of times in the past. This time I pulled in some classic Indian spices to rub into the salmon and also tie into the raita to “kick it up a notch” as Emeril would say. The result is a boldly spiced salmon with creamy, cooling cucumber raita. Serve it over basmati rice and you have an easy, flavorful weeknight dinner. Start by preheating the oven to 425 degrees F. Then place the salmon fillets onto a foil-lined baking sheet, skin side down. Mix all of the spices, including cumin, garam masala, cardamom, and turmeric together and add ginger paste, garlic paste, vegetable oil, and salt. I love to use prepared ginger and garlic paste to make recipes even easier. They’re generally found near the fresh herbs in most supermarkets. If you happen to have fresh ginger and garlic on hand, then just mince the garlic and grate the ginger to make your own paste. When the spices are all mixed together, spread the mixture on top of the salmon and bake for 12 to 24 minutes, or until cooked through. The baking time really depends on the thickness of your salmon fillets. While the salmon is baking, mix together the raita ingredients: diced cucumber, Greek yogurt, garam masala, salt, and some lemon juice. Serve the salmon with the raita and basmati rice or naan. Looking for other salmon recipes? Try this maple mustard salmon or miso salmon with coconut rice. 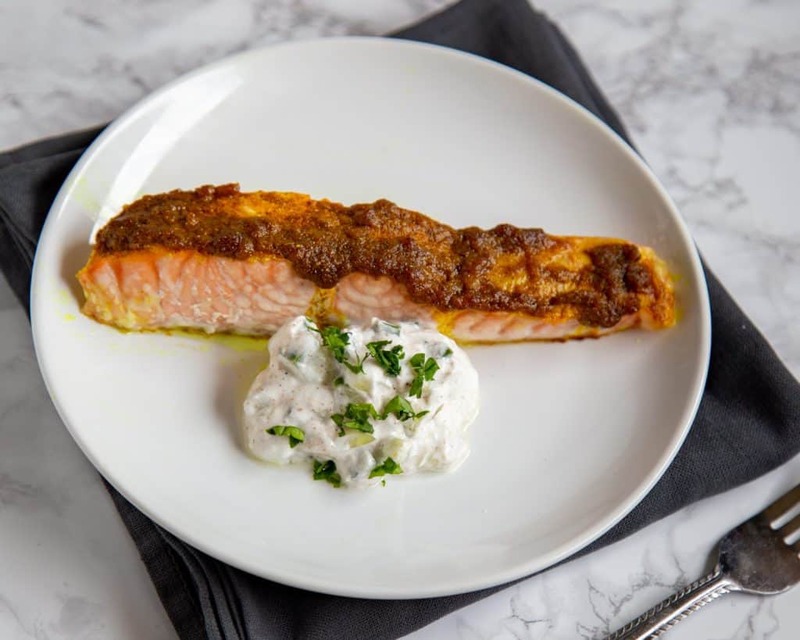 If you tried this recipe for Indian Spiced Salmon with Cucumber Raita, leave a comment and a review below and let me know what you think! Line a baking sheet with foil. Place the salmon pieces on the foil, skin side down. Combine the spices, ginger paste, garlic paste, vegetable oil, and salt. Rub the mixture over the fillets. Bake for 12 to 24 minutes until cooked through. Bake time depends on the thickness of the fillets. While the salmon is baking, combine the diced cucumber, Greek yogurt, lemon juice, garam masala, and salt. Serve the salmon with the cucumber raita and basmati rice. This looks so delicious. I’ll have to add these spices the next time I have salmon. I love the flavor choices! This dish looks so delicious! Wow, this salmon looks fantastic and the raita I bet complements the dish to perfection. I enjoy Indian inspired food, so this is my kind of dinner. What a delicious and healthy dinner! 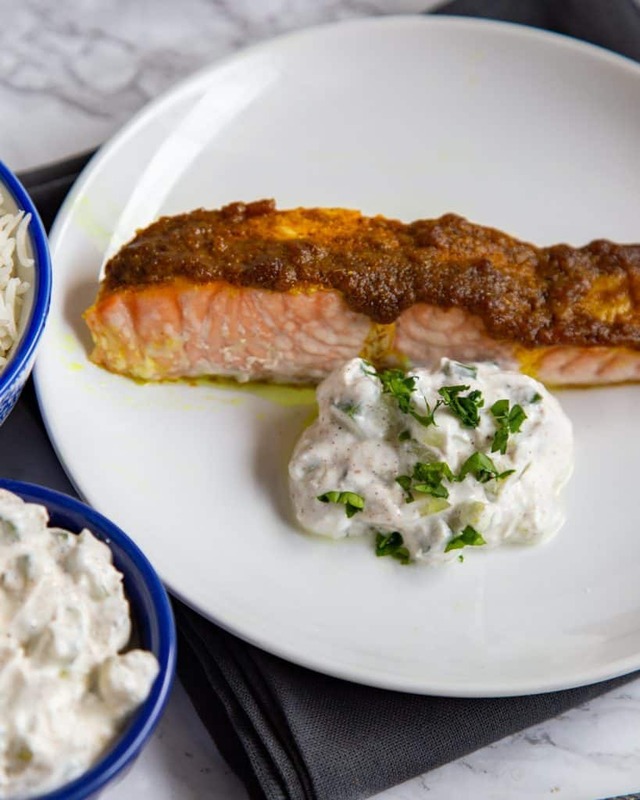 Love the spices you used for the salmon and the raita is the perfect complement. I love salmon! Looks so delicious and perfect for a healthy dinner!